Saljuenak princess cake recipes and savory - the daughter of Snow Cake is a type of pastry shaped like a crescent moon, sprinkled with white powdered sugar. 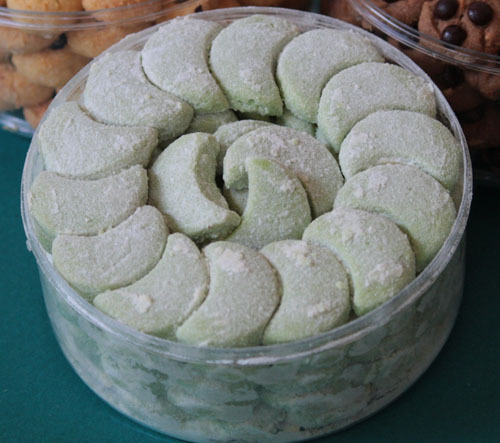 This cake is usually served during special days welcome, such as Eid, Eid al-Adha, Christmas, Chinese New Year and other holidays. The distinctive feature of this pastry is refined sugar that coats the entire surface of the cake, so it makes sense and appearance becomes more beautiful, attractive and perfect. Snow princess cake recipe is almost the same with the other pastry recipe, the only difference lies in the content of the cake and assorted spreads. Beat sugar, eggs, butter and salt until t. After that with sago flour and beans that have been roasted, then stir until blended. Gilas 3 mm thick batter, then print. The next place the cake that has been printed into the pan which has been greased beforehand. Put it in the oven with a temperature of 170 degrees Celsius for 15 minutes or until cooked, remove from heat. While still hot, sprinkle with sugar or refined sugar sow, chill. Put it in a jar and snow princess cake ready to serve. Beat margarine, salt, powdered sugar and vanilla paste for 2 minutes until soft. Then add the egg yolk and beat until blended. After that enter the flour, cornstarch, and milk powder as he sifted and stirred until blended. Then add peanuts, stir again until blended. Take a bit of dough, shape oval. Furthermore into the pan which has been greased beforehand. Put it in the oven with a temperature of 130 degrees Celsius for 45 minutes until cooked. Lift, while hot roll on top of sugar donuts. Cool and put in jars. Beat margarine, cold unsalted butter, powdered sugar and salt for 30 ns or until well blended. Then enter the egg yolks and paste, beat well. Add cashew nuts finely and stir well. After that enter the flour and baking powder as she sifted and mix well. Milled dough to a thickness of 1/2 cm, then print with a crescent shape cookie cutter. Furthermore, place it on a baking sheet margarine and do the same thing until the dough runs out. Bake in the oven at a temperature of 150 degrees Celsius for 20 minutes or until done. Remove and let cool. Once cool, put pastries and powdered sugar in a plastic bag. Whisk gently until smooth sugar cookies wrapped. Similarly, recipes and how to make a princess cake snow this time. Good luck making a snow princess cake at home and thank you for this article had been reading. 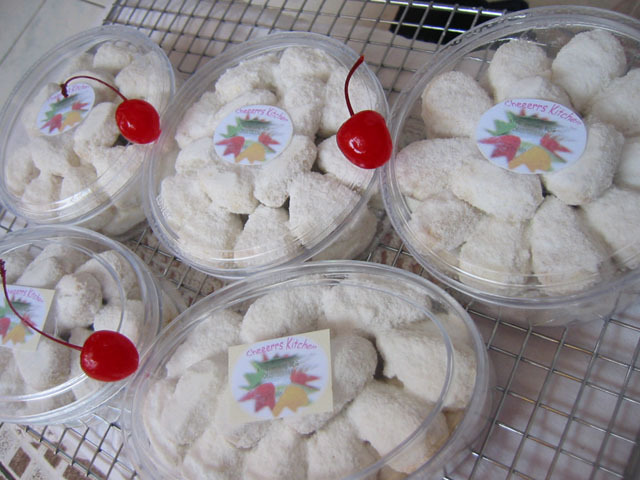 0 Response to "KUMPULAN RESEP KUE KERING PUTRI SALJU Snow Cake Recipes Delicious and Savory "